Mysterious Yarns: We have progress!! I've been practising my spinning over the last few days, since the Spinning Wheel Maintenance Kit from Twist Fibre Craft Studio arrived in the post. So I got the spare con-rod strap I needed to fix the wheel. And I've been trying in the odd spare moment over the last few days and today I have finally made some progress. Today for the first time I managed to keep the wheel spinning and feed the fibre through at the same time, for more than a couple seconds at a time. Now I'm not saying that the resulting yarn is pretty or even or anything you might want to knit with. But it does bear a passing resemblance to yarn so I am pretty pleased. While it is by no means perfect it is getting better and I am finding it easier all the time to get my hands and feet to do what they are supposed to do. I got to the S&B meeting in Birmingham on Saturday, which I expected to be the last time before Christmas, but I find I'm off next Saturday too so I shall try and go then as well. I had a lovely morning in Birmingham, with a trip to market to buy fish for dinner, then over to the Pallasades where there is a new bookshop which sells what looks like publishers / distributors returns. Anyway they had some good stuff at reasonable prices so I bought one or two. 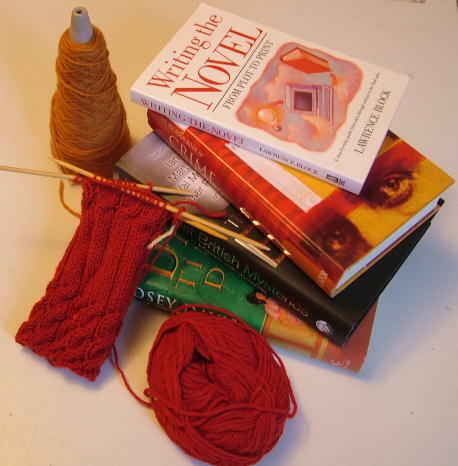 All in all what with the knitting and the books and the fish pie for dinner it was a pretty good day. And today I realised that I'm not actually working on Monday as I thought. I don't start work again until Tuesday. An extra day off that I wasn't expecting - how good is that! I hope you enjoyed your extra day off. What a wonderful surprise! I felt a bit like that when I got back from my annual holiday this year and realised I'd been away over the August bank holiday, so was entitled to take one more day than I thought over the rest of the year. I had a wander around the new book shop yesterday. It was doing quite well. I only bought one, and it wasn't for me - such restraint! !